Ernest “Che” Guevara is best known for his political activism in Cuba during the early 1950s and 60s. More recently, his youth and perceptive observations have gained more popularity with the book and movie release of The Motorcycle Diaries. This collection of journal entries from Che’s journey through South America with his friend Alberto on La Poderosa II is an insightful look into South America and its poverty stricken habitants. Che’s hypnotic descriptive writing is incredibly insightful despite his young age (he was 23 when he set out on this year long road trip). It begins with about 30 pages of introductions from Che’s daughter, maps of the road trip as well as analysis of Che’s trip. These introductions help develop a frame of mind when reading Che’s notes by placing this trip in a context with which the reader can understand. Che was studying to be a doctor, and had just finished taking his exams when he set off on the trip. He stopped in many leprosy colonies, helping when he could. He and Alberto had many adventures and misfortunes in their travels, hitchhiking when La Poderosa II finally gave out, relying on the hospitality of the community to provide food and shelter then the two men ran out of resources. Sometimes the stories seem the same in each country and city he would visit, but I suppose that reflects something of the nature of Latin American life during that time. Its obvious this cross-country journey planted the seed of Che’s future political career as a revolutionary in Cuba, and from reading his notes, you can’t help but agree with his ideals and beliefs. Che’s work is filled with moments of humor, such as attempted to cross the desert by foot. Che writes “Until what point our actions were “heroic,” as one policeman put it, we’re not sure, but we began to suspect, I think with good reason, that the definitive adjective was approximating something more like “stupid.””(p82). There were also moments of real consideration and understanding of human suffering because of poverty and ill-effective governments. “…individuals in poor families who can’t pay their way become surrounded by an atmosphere of barely disguised acrimony; they stop being father, mother, sister or brother and become a purely negative factor in the struggle for life and consequently, a source of bitterness for the healthy members of the community…” (p70). He alternates between these two moods, and sometimes throwing in awe, as when describing the city of Cuzco. We see the world through his eyes in this selection and in a way, you can almost visualize what he sees when he writes with passion and colorful language. This particular copy also contains 12 pages of photographs from Che’s and Alberto’s trip, as well as a transcript of a speech Che gave to a group of medical students in Cuba almost 8 years after this trip. I am hoping to rent the movie starring Gael Garcia Bernal and Rodrigo de la Serna and compare that with the book sometime this week. 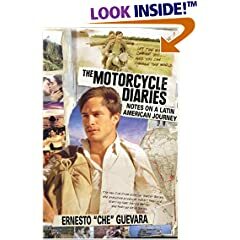 This entry was posted in Books, life, Nonfiction and tagged Ernest "Che" Guevara, Motorcycle Diaries. Bookmark the permalink. I didn’t know that this book was available in English! I have to look for it then, in local bookstores. A week ago, I watched the movie and it was so funny, especially Alberto’s character. It seems like these two got into a lot of scrapes on their trip. I really want to see the movie now. I hope some of my favorite scenes ended up being in the movie. I’ve just watched this film having never read the book or really had a lot of knowledge about South American history. It really is an amazing story.